I love peaches…totally!! 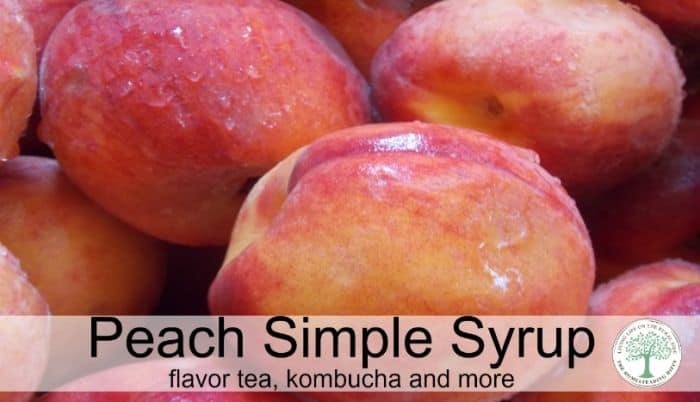 The smell, the feel, the juicy-ness of them.Peach simple syrup is so awesome for flavoring kombucha, tea, and water kefir as well! 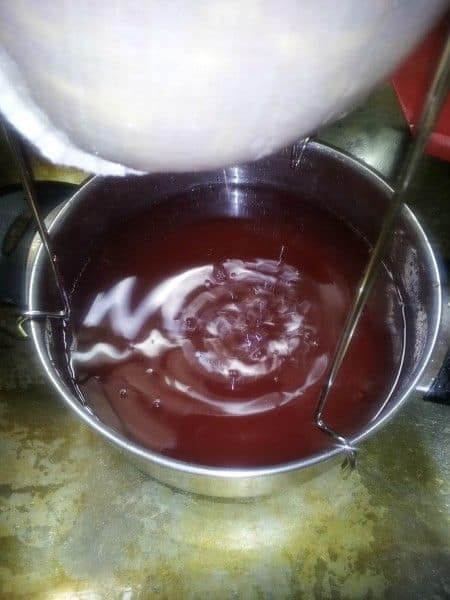 As I was canning peaches recently, I held back the peels and pits to make some jelly and thought, “Why not just leave some as syrup?” And, peach simple syrup was “born”! It’s such a simple idea, I can’t figure out why I hadn’t done it before! So, I did! 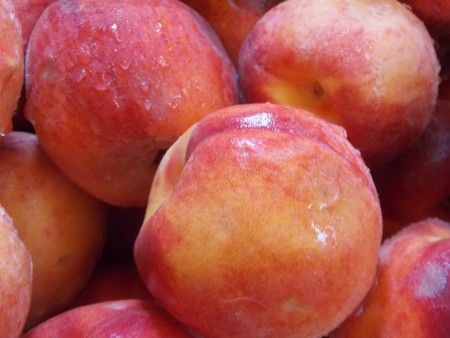 Here’s how to make your own peach simple syrup. Gather your fresh peaches, and rinse them off. As you are peeling them for canning, save the peels and put into a large pot. Add equal amounts of water/sugar to cover. I used 20 cups of water, so I added 20 cups of sugar. You can use white sugar, sucanat, or even coconut sugar for this recipe. However, for the amount I made, organic sugar cane was the best price for me. Bring to a boil, then allow to “steep” for about about 2-3 hours, while it completely cools. You don’t want to do the next step with boiling liquid. Trust me on this one. Drain through a cheesecloth. Or jelly bag, if you have one. Bring the syrup to a rolling boil, and place in clean jars. Water bath both pints and quarts for 25 minutes. Allow to cool, then wipe jars clean. As always, store in a cool dry place and use within a year. Any jars that didn’t seal will need to be used within a week, and stored in the fridge. Viola! Peach simple syrup! To use, I add 1/2 cup syrup to 1/2 gallon of kombucha, or add 1/4 cup to 1 quart of kefir water. You can also use it on pancakes, in smoothies, or adding a couple tablespoons to hot or iced tea. As a matter of fact, with iced tea, there is no sugar to dissolve, and the flavor of the peaches really shines here! Have you ever made peach simple syrup? What did you use it for? this looks so good!we love peach tea so this would be the perfect peach syrup!thanks for sharing! My husband loves Kombucha so this will be a nice treat to surprise him with! Thanks for the idea! It looks so good. I can’t wait to try it! I love peaches and just picked up my last basket of the season from the farmer’s market. What a great way to use the peels! Yum!!! Peaches are my favorite!! I am going to have to make this with all of the peaches my Grammy gave me from her yard! It seems great and delicious. My kids will love it. I will try it for them. Hi there! 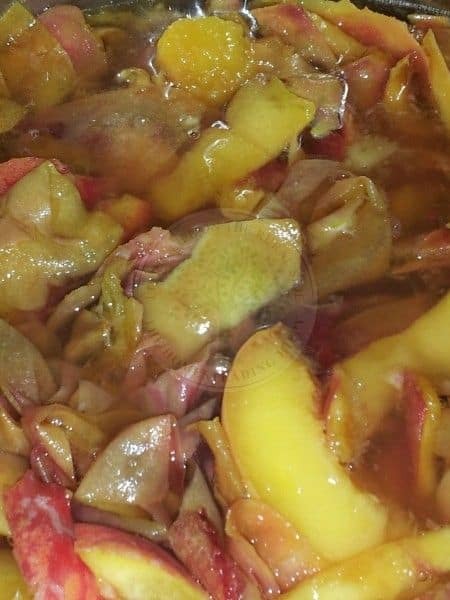 I found this post while googling, and wondered if you can tell me about how many pounds of peaches you peeled for this recipe? I’d like to make it (a smaller amount, as I don’t have that much sugar), but I’m not sure how many pounds worth of peach (peels) you started with. Thanks so much for the help, I’m really excited to make this!